Alastair Humphreys has cycled the world, completed marathons through the Sahara Desert, canoed the Yukon River and is a National Geographic Adventurer of the Year. It’s an impressive CV. But what he is most famous for is encouraging people to get out in their local area and sleep under the stars. We met Alastair at SXSW and were blown away by his passion and authenticity. We’re over the moon to share his story with you. Alastair was in his first year at university, sitting in a boring lecture, distracting himself by planning a cycling trip around Italy. A friend passed him a note asking if he would like to cycle the Karakoram Highway, an 800-mile ride between China and Pakistan. It was on this trip that he discovered his true calling as an adventurer. That first taste of astonishment and possibility was enough to set both Alastair and his friend (Rob Lilwall) on the path to becoming career adventurers. Since then, Alastair has spent over five years travelling the world on a bike, on foot and by sea. In 2012, he was named National Geographic&apos;s Adventurer of the Year. Check out this short video packed with incredible footage to find out why. Despite having such an impressive resume of exotic expeditions, it was Alastair’s domestic adventures that won him the Adventurer of the Year accolade. In 2011 he never left the UK. Instead, he focused on microadventures – local trips that began and ended at home. Often, these clever, little activities were nimble enough to be completed in the time between finishing work at 5pm and back to work the next morning at 9am. Alastair was inspired to break down the elitism of adventure and make it more accessible to everyone. He wanted to prove that adventure is more of a state of mind than a destination. He set out to take on activities that featured all the joy of his trips abroad but that could be achieved locally, cheaply and without massive time commitment. Alastair’s microadventures are designed to deliver a physical challenge, solitude and beautiful landscapes without the need to quit work or sell the house like a full-time adventurer. 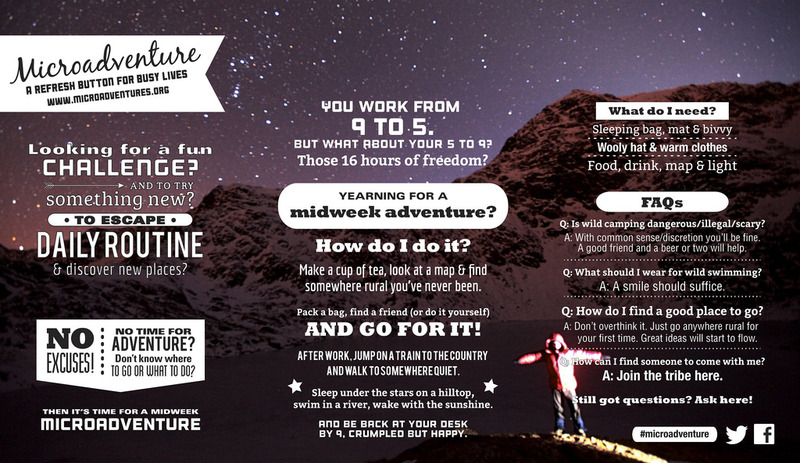 To encourage others, he set-up a year-long blog chronicling his journeys and developed microadventure faqs to help you conduct your own. Since Alastair first coined the term, the concept of microadventures has become increasingly popular with an active community dedicated to helping each other explore. As urban populations grow and remote rural communities diminish, Alastair expects the popularity of turning off your phone, sleeping under the stars and taking a microadventure to surge.